Here are this week’s Amity Varsity Sports Schedules. Boys Volleyball v. Masuk Away – David Strong Gymnasium @ Masuk High School at 5:15 p.m. Girls Tennis v. Shelton Away – East Village Park – Shelton at 10:30 a.m. 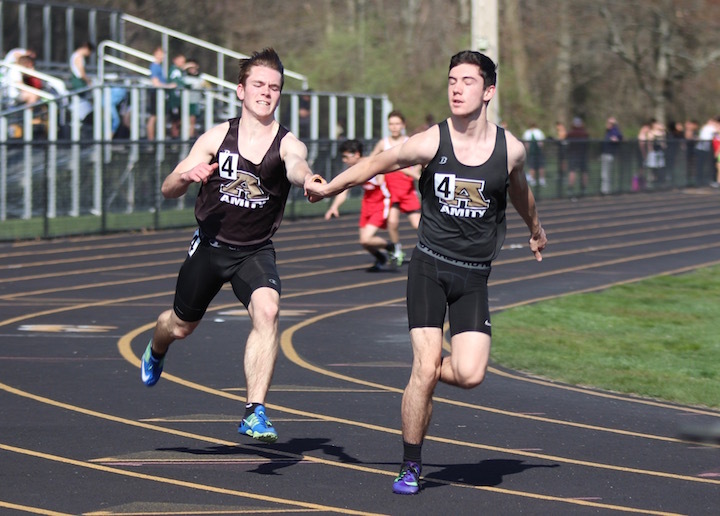 Boys Outdoor Track v. Branford, Foran, Fairfield Prep Home – Amity High School at 11:00 a.m. Girls Outdoor Track v. Branford, Guilford, Lauralton Hall Away – James L. MacVeigh Alumni Athletic Complex-Track at 11:00 a.m. Boys Tennis v. Lyman Hall Home – Amity High School Tennis Courts at 3:45 p.m. 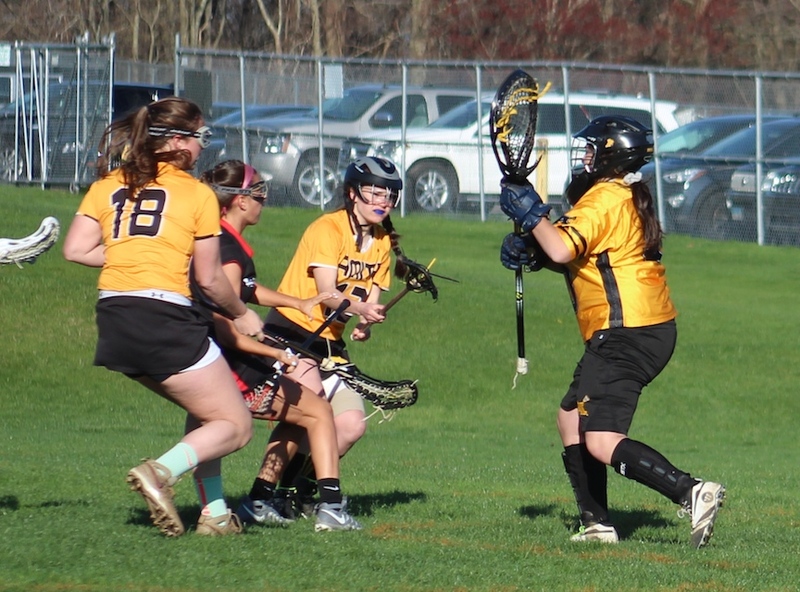 Girls Lacrosse v. Hamden Home – Amity High School – Field # 3 at 3:45 p.m. Boys Tennis v. Hall (Scrim.) 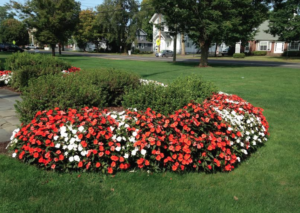 Home – Amity High School Tennis Courts at 2:30 p.m. Baseball v. Foran Away – Ken Walker Field at 3:45 p.m. Boys Lacrosse v. Sheehan Home – Amity High School – Field # 3 at 3:45 p.m.
Softball v. East Haven Home – Amity High School Softball Field (Field #6) at 4:15 p.m. Boys Volleyball v. Daniel Hand Away – DHHS Gym at 5:30 p.m. 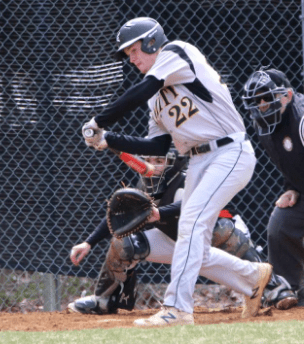 Baseball v. Norwich Free Academy Away – Dodd Stadium at 11:00 a.m. Girls Lacrosse v. Southington Away – Turf Field SHS at 3:45 p.m. 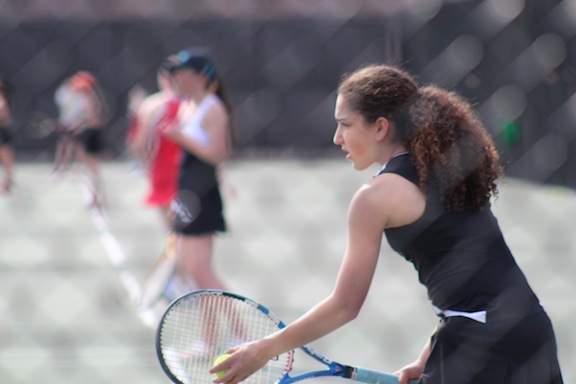 Girls Tennis v. Jonathan Law Home – Amity High School Tennis Courts at 3:45 p.m. Boys Outdoor Track N.Y. Relays @Icahn Stadium, Randalls Island Away at 9:00 a.m.
Softball v. Glastonbury Away – Glastonbury High School at 11:00 a.m. Boys Lacrosse v. Bunnell Away – Bunnell Turf Field at 12:00 p.m. The Spring Sports season has begun. Here is this week’s Varsity Sports Schedule. HOME games are highlighted in RED. Baseball vs Cheshire Away at Cheshire High Baseball Field at 4:00 p.m. Boys Tennis vs Xavier Away at City of Middletown Courts at Wesleyan U., Vine Street at 3:45 p.m. Boys Volleyball vs St. Joseph Away at St. Joseph High School at 4:00 p.m.
Softball vs Fitch Home at Amity High School Softball Field (Field #6) at 4:00 p.m. Girls Tennis vs Sacred Heart Academy Away at Hamden Middle School at 3:45 p.m. Boys Golf vs Xavier Away at Portland Golf Club at 2:30 p.m. 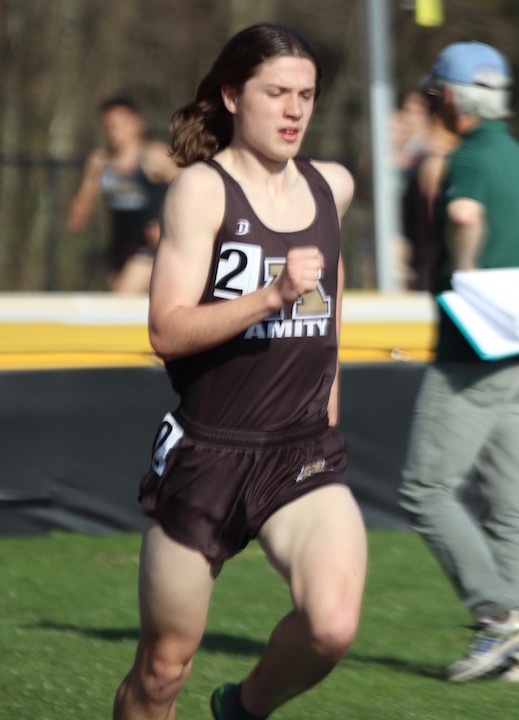 Boys Outdoor Track vs Cheshire, Hamden Home at Amity High School at 3:45 p.m. Girls Lacrosse vs North Haven Home at Amity High School on Field # 3 at 3:45 p.m. Girls Outdoor Track v. Cheshire, Hamden Away at Cheshire High Main Game field at 3:45 p.m. Girls Tennis vs Guilford Home at Amity High School Tennis Courts at 3:45 p.m. Boys Tennis vs Fairfield Prep Away at Walsh Athletic Center Courts, Fairfield University at 3:45 p.m.
Softball vs North Haven Away at North Haven Athletic Complex at 4:00 p.m. Boys Golf vs Hamden Home at The Tradition at Oak Lane C.C., Woodbridge at 2:45 p.m. Boys Lacrosse vs Trumbull Away at McDougall Stadium at 6:00 p.m. Girls Lacrosse vs Daniel Hand Home at Amity High School on Field # 3 at 3:45 p.m. Boys Tennis vs Daniel Hand Home at Amity High School Tennis Courts at 3:45 p.m. Boys Volleyball vs Cheshire Home at Paul D. Mengold Gym at Amity High School at 5:00 p.m.
Softball vs Bristol Eastern Away at Bristol Eastern Front Field at 4:00 p.m. Girls Tennis vs Daniel Hand Away at Polson Tennis Courts/DHHS Campus at 3:45 p.m. Baseball vs Ridgefield Away at Governor’s Park Field (aka Ciuccoli or Old High School) at 11:00 a.m. Boys Lacrosse vs Pomperaug Away at Sports Complex & Track at 4:30 p.m. Boys Outdoor Track at the Daniel Hand Freshman Invite Away at Daniel Hand HS at 9:00 a.m.
We’re right in the middle of the Spring Sports season, every game is crucial at this point. Here are the Spartans’ Varsity games for this week. Girls Golf vs Sacred Heart Academy HOME at Racebrook CC – Orange 3:30 p.m. 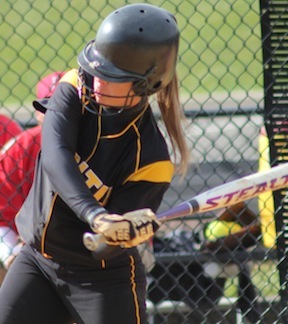 Girls Tennis vs Cheshire HOME at Amity 3:45 p.m.
Softball vs Shelton HOME at Amity 4 p.m. Baseball vs Daniel Hand HOME at Amity 4 p.m. Boys Lacrosse vs Guilford AWAY at Guilford High School 7 p.m. 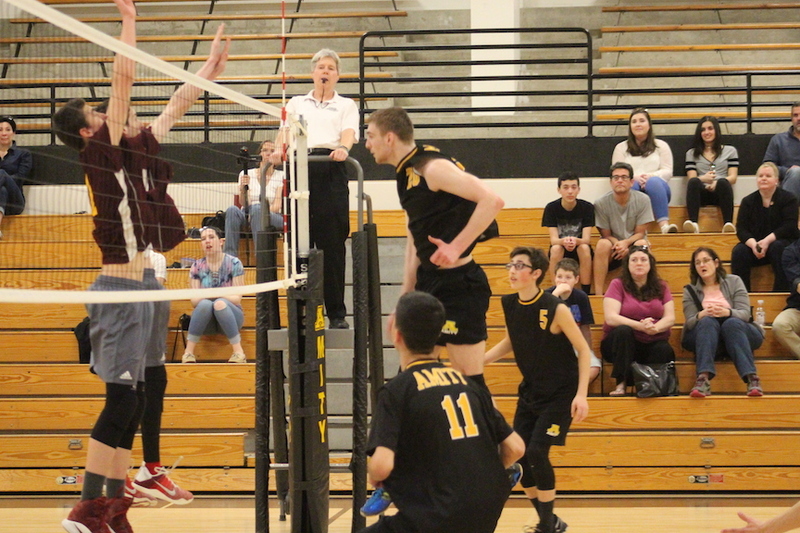 Boys Volleyball vs Newtown HOME at Amity 6 p.m. Boys Golf vs Hamden HOME Oak Lane CC – Woodbridge 2:45 p.m. Boys Track vs East Haven AWAY at East Haven High 3:45 p.m. Girls Track vs East Haven AWAY at East Haven High 3:45 p.m. Boys Tennis vs Shelton AWAY East Village Park 3:45 p.m. Girls Lacrosse vs Mercy HOME at Amity 3:45 p.m. Boys Golf vs Shelton HOME – The Tradition at Oak Lane C.C. – Woodbridge 2:45 p.m. Girls Golf vs Mercy AWAY at Lymans Golf Course 3 p.m.
Softball vs Hamden AWAY at Hamden High 3:45 p.m. Boys Tennis vs West Haven HOME at Amity Tennis Courts 3:45 p.m. Girls Tennis vs North Haven HOME at Amity Tennis Courts 3:45 p.m. 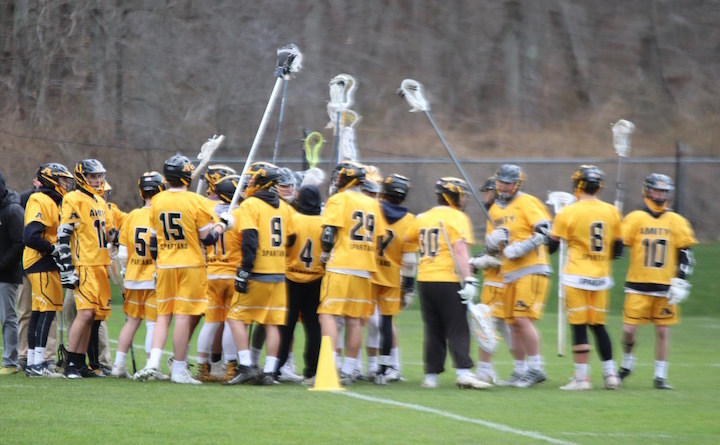 Boys Lacrosse vs East Lyme HOME – Amity High School – Field # 3 4:00 p.m. Baseball vs Career Magnet AWAY – East Shore Athletic Complex 4:00 p.m. Boys Volleyball vs Daniel Hand AWAY at Hand 5:30 p.m. Boys Golf vs Fairfield Prep HOME Oak Lane CC – Woodbridge 2:45 p.m. Boys Track Louck’s Games AWAY White Plains NY 3 p.m.
Softball vs Sacred Heart Academy AWAY Sacred Heart 3:45 p.m. Girls Tennis vs Guilford HOME at Amity 3:45 p.m. Boys Tennis vs Cheshire AWAY at Cheshire HS 3:45 p.m. Boys Track Irv Black Invite AWAY at Willowbrook Park, New Britain 4:00 p.m. Girls Track Lady Titans Relays AWAY at Sheehan HS 5:00 p.m. Baseball vs Norwich Free Academy HOME at Amity 11:00 a.m. Boys Track Irv Black Invite AWAY at Willowbrook Park, New Britain, 9:00 a.m. 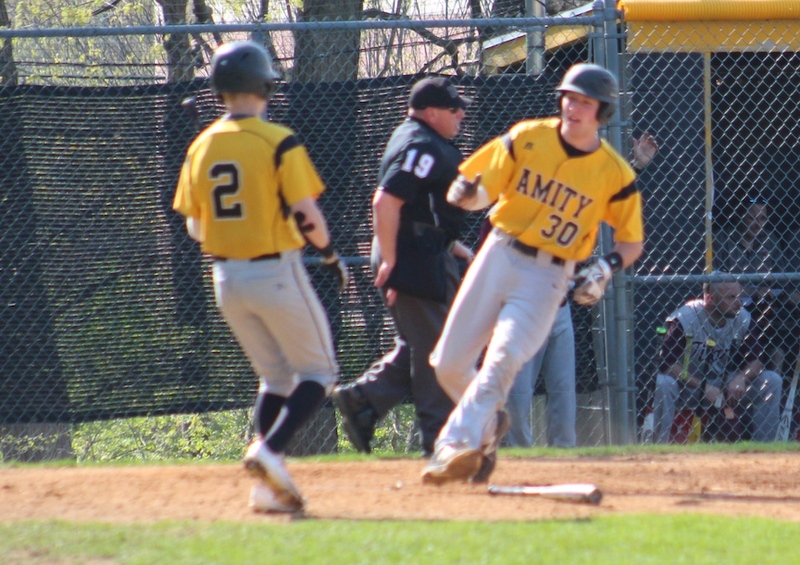 The Amity Spartans 2018 Baseball season began last week and so far, they are 2-2.Here’s a rundown of the first four games. 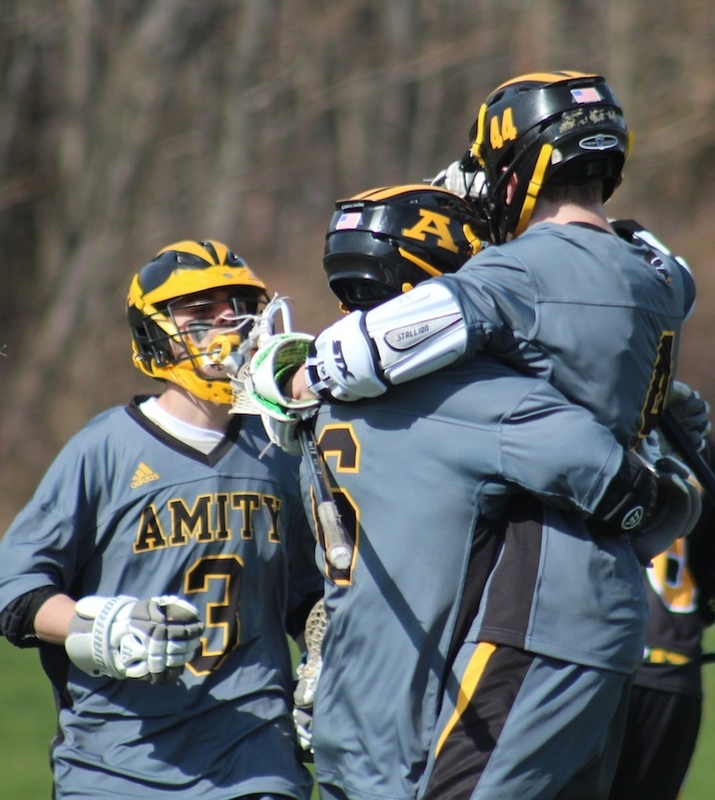 The Amity Spartans were home for their season opener against Cheshire on April 5. Ben Lodewick pitched the game, and CTs top catcher Pat Winkel was behind the plate (and 15 Major League scouts were on hand to check him out). The first inning was scoreless, then, Cheshire got in one run in both the second and third innings. The Rams retained this 2-0 lead through the fifth inning, in the sixth, they scored five times, and the Spartans were still scoreless. 7-0 Cheshire. 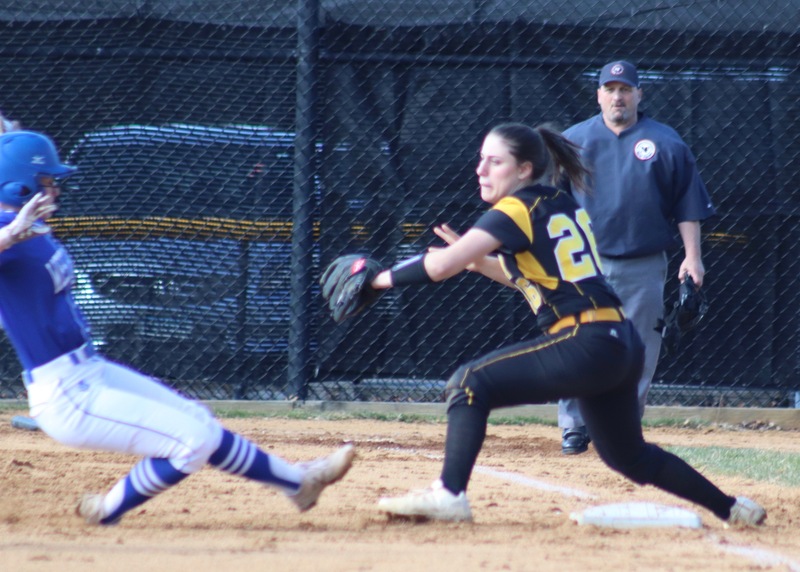 The Rams pulled even further ahead with one final run in the last inning, and Amity came alive, avoiding a shutout with three runs. Records: Cheshire 1-0, Amity 0-1. 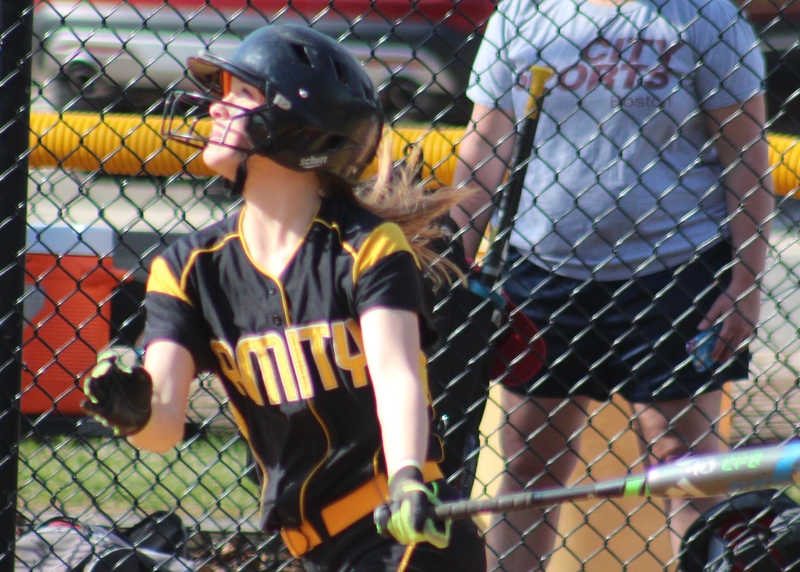 The Amity Spartans were back on the home field for their second game of the season on Saturday, April 7 this time against Ridgefield. 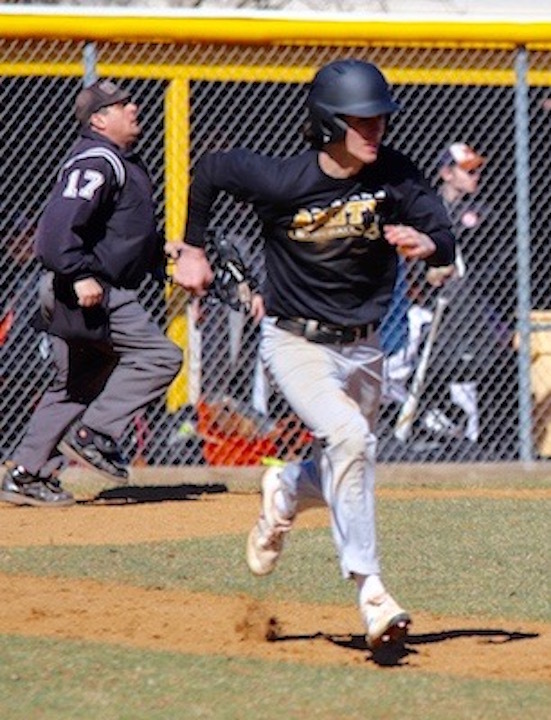 With Junior John Lumpinski on the mound and Senior Pat Winkel behind the plate, and Sebastian Formica as shortstop, the Spartans had a very good day. Lumpinski threw six shut out innings, while Amity quickly took a 3-0 lead by the end of the second. The Spartans got another run in the fourth, then scored three more in the fifth, and one in the sixth giving them a 8-0 lead. Ridgefield had a huge seventh inning making five runs, impressive, but it wasn’t enough. Amity won this one 8-5. The Spartans were on the road in Fairfield for a game against Fairfield Prep on Monday, April 9. Amity took a quick lead with two runs in the first, adding three in the second. Prep scored one run in the second and two in the third. Third inning score 5-3 Amity. In the fifth, Prep tied things up 5-5. After two scoreless innings, the game went into overtime, at which time Prep added the winning run. Final 6-5 Prep. 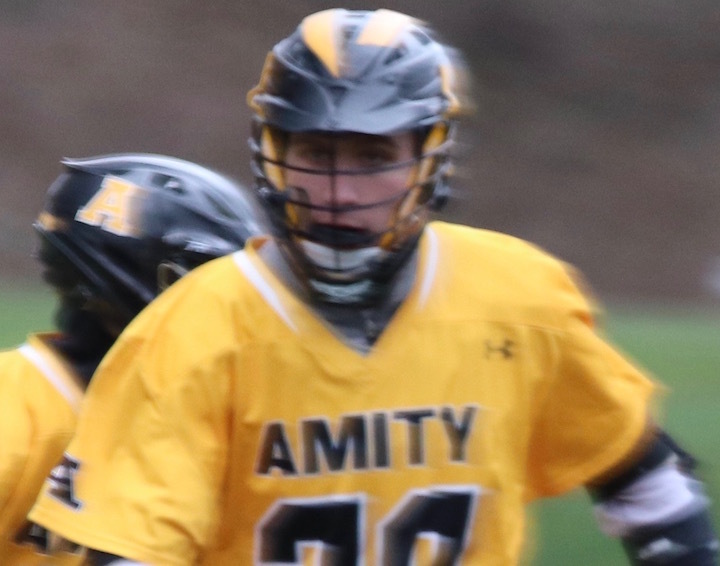 The Amity Spartans hosted Xavier in Woodbridge on Wednesday, April 11. Pitcher John Lumpinski did a phenomenal job striking out six. Jack Nolan had a home run with two runs scored and three RBIs. Pat Winkel had two RBIs and scored two runs. The game only went five innings and Amity enjoyed an easy 10-0 victory. NEXT UP: The Spartans are on the road for the next two games. Saturday, April 14 at Shelton, 1 p.m., and Monday, April 16 vs Daniel Hand at Poison Baseball Field, 3:45 p.m. If you follow Amity Varsity Sports, this is a fine time to get a preview of the teams that will be playing this spring. 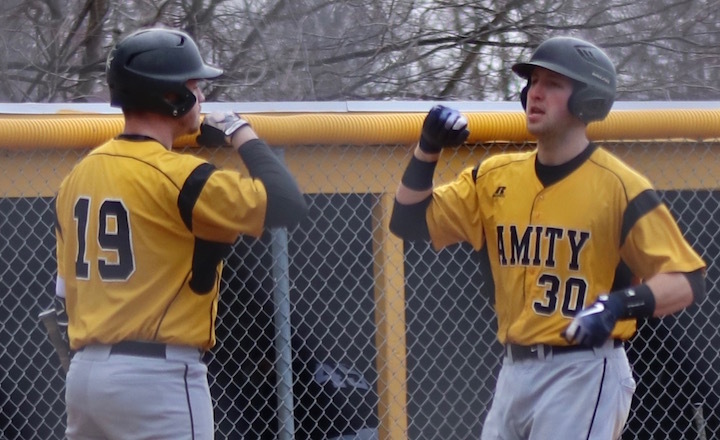 Amity Baseball, starting from scratch after ending its record winning streak in 2017. Girls Softball working hard again to maintain its great reputation. Boys and Girls Tennis back on the court to show they are great competitors. Boys and Girls Lacrosse back again to prove they have what it takes. Most of the scrimmages are away, but Baseball is on the home field twice this week, as is girls’ tennis. The week wraps up with the Baseball and Softball Jamborees on Saturday, so we can see how they will play against different teams. Baseball v. Hamden (Scrim. ), Away at Hamden HS 3:45 p.m. Baseball v. St. Joseph (Scrim.) Home at Amity High School on Field #1 3:45 p.m. Boys Lacrosse v. Hopkins School (Scrim.) Away 4 p.m.
Softball v. Sheehan (Scrim.) Away at Sheehan HS Softball Field 3:45 p.m.
Winter Sports Awards Paul D. Mengold Gym at Amity High School 6:30 p.m. Boys Tennis v. Hopkins School (Scrim.) Away – Hopkins 3:30 p.m. Girls Lacrosse v. North Branford (Scrim.) Away – North Branford High School 4 p.m. Girls Tennis v. Hopkins School (Scrim.) Home – Amity High School Tennis Courts 3:45 p.m. Baseball v. Staples (Scrim.) Home – Amity High School – Field #1 3:45 p.m. Boys Lacrosse v. Norwalk (Scrim.) Away – Testa Field, NHS 4 p.m.
Softball v. Daniel Hand (Scrim.) Away – Green Hill Rd Softball Turf Field/ DHHS Campus 3:45 p.m. Baseball Jamboree Home – Amity High School 10 a.m.
Softball Jamboree Home – Center Field – Woodbridge 10 a.m. The number 1 Amity Spartans Baseball Team played in the CIAC Class LL semifinal against Danbury in Waterbury today. The Spartans got a quick 2-0 lead and just kept going. Danbury picked up two runs in the first six innings but simply couldn’t pass Amity’s 3 to 4 run lead. The Amity Spartans won 5-2 and advance to their fifth consecutive state championship game, this year against Staples. It’s been a long season, but we are almost there, the Amity Spartans Baseball team shut out Fairfield Ludlowe 12-0 today in Woodbridge. It was like a nice autumn day up on the hill, windy and cloudy – perfect baseball weather. The only ones sweating it out were the Falcons. The game got off to a slow start with no score in the first inning. No action in the fourth. And that was all she wrote, neither team scored after that and Amity advances in the tournament. The Lady Spartans ended their season today in Stamford, but they had a really good run. Amity Sports fans, there’s a convenient treat in store for you on Tuesday, May 30. The Spartans Baseball and Lady Spartans Softball teams both will be playing their CIAC First Round games at Amity High School at 4 p.m. The Spartans will take on NFA/Stamford and the Lady Spartans will be up against Fairfield Ludlowe. Because both of these games are on the road for all the marbles — the state title, you should get there early for a decent parking space. Best of luck to both of these fine teams. Play ball like we know you can! Go Amity! 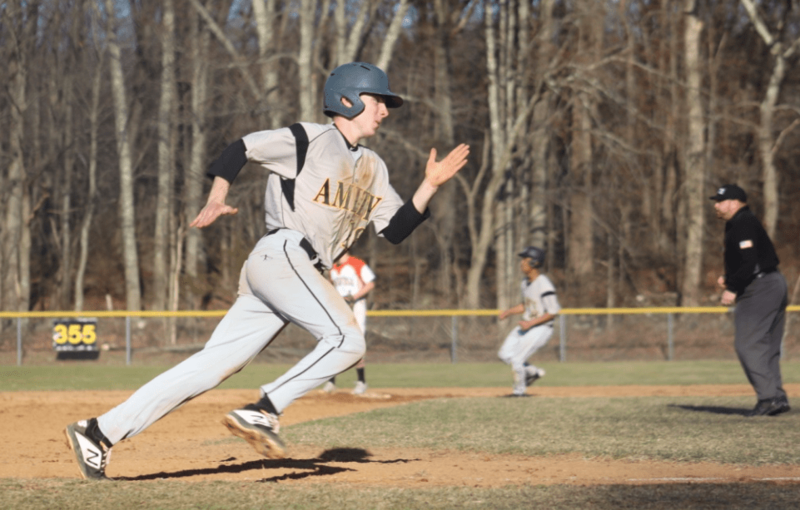 The Amity Spartans Baseball team was on the road in Milford on Thursday, for a matchup with Jonathan Law. 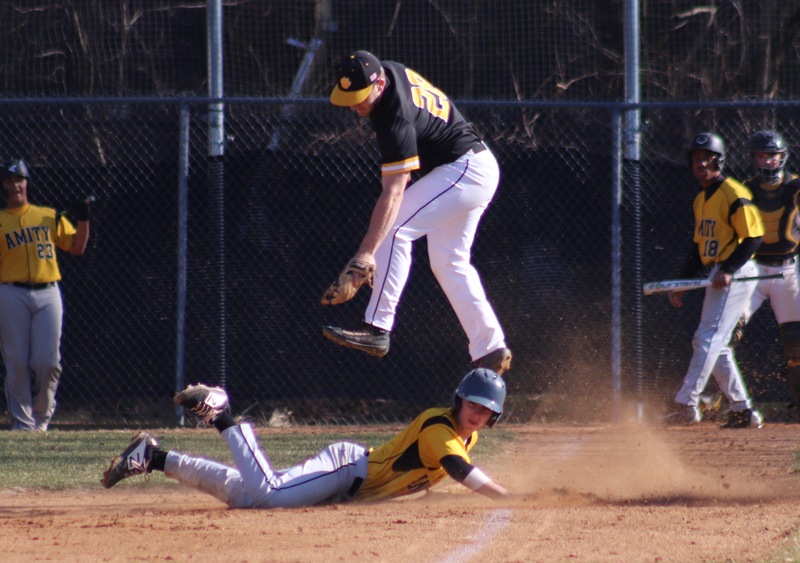 The Spartans took an early lead with 4 runs in the first inning, followed by three in the second, but the Lawmen kept them on their toes with five runs in the second inning. Amity won its ninth consecutive game 15-10. Teddy Hague was the winning pitcher. On Friday, Amity hosted the Sheehan Titans in Woodbridge. Max Scheps pitched this one and did a fine job. The Spartans shut out the Titans 10-0. In the first inning, the Titans’ center fielder went after a fly ball, hit the fence, and crumpled to the ground. His teammates, Amity players and the Amity trainer ran to his assistance as the left and right fielders yelled, “we need a towel!” The boy reportedly cut his face up, but never lost consciousness. He should be alright, and we wish him well. Team records: Sheehan 6-5 (3-1); Amity 10-0 (4-0).